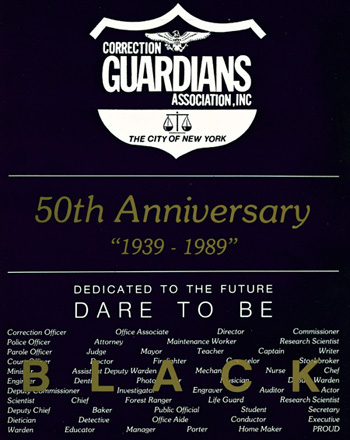 Front cover of 1989 NYC Correction Guardians' 50th anniversary souvenir journal. historical information on African American strides in NYC, NYS and U.S. law enforcement. This is Part I. Images and text below are from the journal's first three pages. The various Guardians Association throughout the country represents African-Americans employed in law enforcement. The Correction Guardians Association, Inc. is a Fraternal Organization formed to develop and preserve the spirit of comradeship and fellowship among its members; to focus the efforts of its members; kindred organizations and the community of its members in the improvement of the administration of justice so as to more effectively combat crime and juvenile delinquency; and to promote and support those efforts to improve humane relationships in the communities of its members. (d) To COMBAT INJUSTICES wherever they exist. The Correction Guardians Association, Inc. represents over 5,000 (55%) of the Uniform and Civilian Staff in the New York City Correction Department, from Officers to Supervising Wardens, Clerical Staff to Deputy Commissioners. It is an honor and a pleasure to welcome you to our Golden Anniversary Celebration; fifty years of service to the African-American community and the City of New York. It is a privilege to honor the finished product of our past presidents who in their wisdom and dedication structured an organization that would last fifty years. One of the purposes of this organization is to fight injustices wherever they exist; we have never backed down from that challenge. We have been in the vanguard, through the years, of the Civil/Human Rights Movement. We have fought the ignorance of: predjudice, racism, bias, favoritism, and cronyism. We have assisted in the feeding of starving Ethiopians through Africare. We have, and still are, fighting for the end of Apartheid in South Africa. We still fight for the freedom of Nelson Mandela. Our challenges to cultrally biased civil service exams are well known. In 1988, we sucessfully challenged an arbitrary pass mark of 77% for the warden’s examination that kept a large number of qualified African-Americans off the list. We have also dedicated ourselves to the betterment of African-American Youth. We have taken on the role of family. 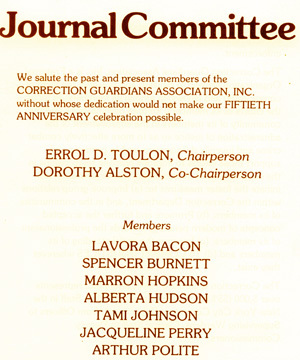 Page 2 "salute" to NYC Correction Guardians' 50th anniversary souvenir journal committee. It is our goal to aid our youth; to help them to grow ethically, educationally, and spiritually. It is our duty to convey our history and experience to them. We are the role models to be emulated. It is important that we act as mentors and tutors. Our scholarship program has been very successful to the extent that community business persons are inquiring as to how they may donate towards scholarships. Our efforts as mentors and tutors to the City College “I Have a Dream Program” has been very encouraging(we judge success by the number of graduates that enroll in college). Tonight we celebrate fifty years as an organization; hopefully, the next fifty will not be filled with so many battles. THE STRUGGLE CONTINUES!! !